Looking to throw a Corporate Office Party!? We are the best venue to host some Newport Corporate Entertainment! Take to the water on a majestic 80-foot schooner or 24 foot sloop to experience a luxurious yacht event for your next corporate outing. A popular idea is to sail Newport with your company for a private boat charter aboard one of these yachts. 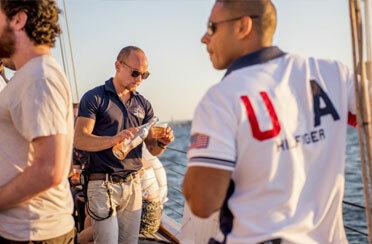 Bring your office to life with energy and sunshine by taking them out sailing in Newport Rhode Island. We have constructed and hosted a variety of Newport Corporate Entertainment and small office functions for you and your colleagues entertainment and excitement. Our boats offer a unique way to host your corporate company party. Dazzle and impress. 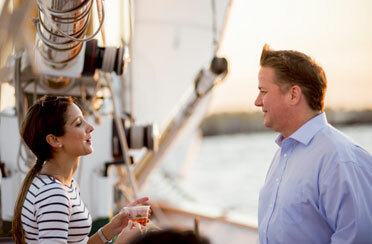 Relax and enjoy and step away from work to enjoy sailing Narragansett Bay aboard our fleet for your next office event! Plan your private corporate yacht charter with us and let our professional crew take care of you. Our classic boats, Schooner Adirondack II and Sloop Eleanor create a experience of adventure, comfort, speed, grace and elegance. The Schooner Adirondack II can host up to 57 guests while the Sloop Eleanor can host up to 24. Both catering and bar of your choice are available to be added to your afternoon sail or sunset sail aboard one of these yachts. Escape the heat and celebrate with your colleagues and associates! 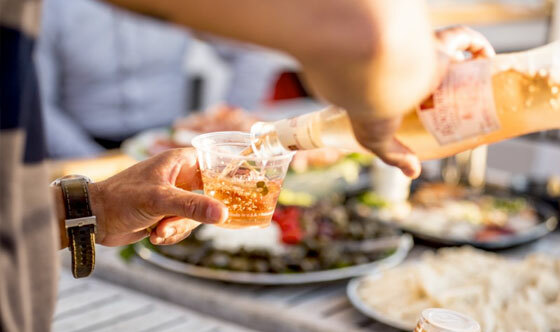 Host your company party on a private boat charter and go sailing aboard the Schooner Adirondack II or the Sloop Eleanor. 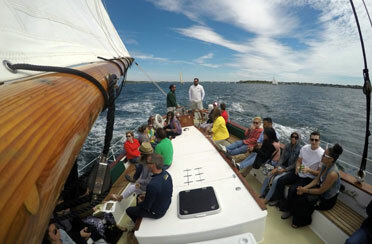 Sail Newport with your feet kicked up and a glass of Champagne in hand. Toast and celebrate the work year and all the accomplishments that were made. Encourage your brokers, sellers or employees by offering a party on the water aboard a luxury yacht in Newport Rhode Island! Sail aboard the legendary yacht; Schooner Adirondack II – which is sure to inspire your team! What could be more rewarding then spending a relaxing and visually stunning experience aboard a classic schooner as it sails through the majestic Narragansett Bay. Opening a flagship store? Releasing or marketing a new product? Starting a new company? Choose the beauty of the Narragansett Bay and one of majestic yachts for your next promotional purpose. With our classic boats, your product/event/company, will kick off with an excellent start and head into the bright future. Looking to impress your client(s)? What better way to do so than sailing on an open yacht and cruising through Narragansett Bay with the wind in your hair and sun upon your face? This is a one-of-a-kind experience aboard a one-of-a-kind yacht that will leave a lasting and memorable impression for clients big and small.